EDITOR’S NOTE: This post originally appeared on Agony & Ivy on Aug. 8, 2010. The 1984 Cubs ushered in the “yuppie era” at Wrigley Field. Seemingly overnight, the ballpark transformed from a slowly decaying, outdated, quirky facility to a 40,000-seat singles bar, a tourist attraction, and a baseball shrine. Harry Caray went from being an old, washed-up White Sox announcer to the hip grandfatherly Cub Fan, Bud Man. The bars that surrounded the park changed from quaint family-owned dives with juke boxes to corporate-owned establishments with dee jays. In the old days, the surrounding rooftops were usually empty and only occasionally would someone be seen watching the game from an across-the-street perch. After Ryno, Jody, The Sarge, and The Penguin, the rooftops became Big Business. When the Tribune Company bought the Cubs, they expressed their desire to install lights at Wrigley Field but the ball did not really begin rolling until the explosion in the Cubs’ popularity after the ’84 division championship season. 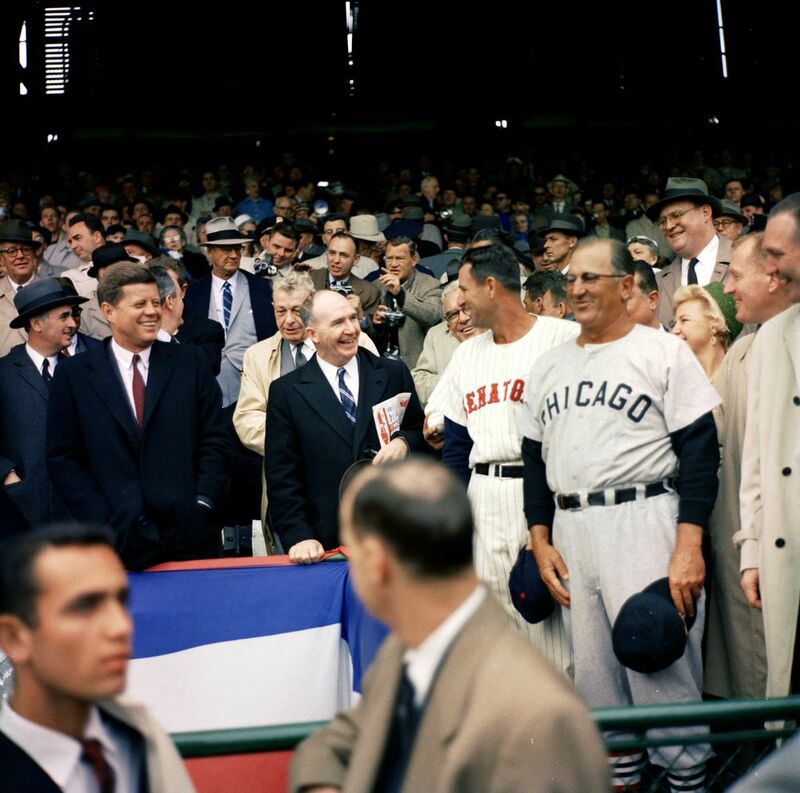 There was some opposition to night baseball from groups like Citizens United for Baseball in the Sunshine, but with Major League Baseball applying much of the pressure, the installation of lights at Wrigley Field seemed inevitable. On Feb. 25, 1988, the Chicago City Council passed an ordinance permitting the Cubs to play 18 night games annually through 2002. Eight night games were permitted for the 1988 season. Construction of Wrigley Field’s six light towers began on April 7, 1988 and was completed on June 21. The 1988 eight-game slate of night games was announced by the Cubs on June 20 with the first scheduled for Aug. 8. Demand for tickets to the 8-8-88 game was so great that a promotion by WGN Radio and True Value awarding 500 tickets received 400,000 applicants. It certainly was the first baseball game at Wrigley Field scheduled under lights, but it was not the first night game. On Friday, June 25, 1943 the Cubs and Cardinals played a game at the Friendly Confines that was promoted as a “twilight game” and began at 6 p.m. Cubs pitcher Hi Bithorn, no doubt aided by the long shadows of the grandstand, pitched a two-hit complete game in the Cubs’ 6-0 victory. The game lasted 2 hours, 17 minutes and was completed 13 minutes before sunset on what is one of the longest days of the year. As the Cardinals batted in the ninth, I imagine that it resembled a scene that played out in our neighborhood on so many occasions while I was growing up. Our evening pickup games would continue until we couldn’t see the ball, long after the streetlights had gone on. As novel as that evening, it was not a rousing success at the box office. A wartime crowd of just 6.620 turned out which helps explain why the game has been long forgotten. I’ve never heard any of the old-timer Cubs fans I know discuss it. It also explains why the promotion was not repeated in subsequent years. The Cubs’ 1943 season attendance of 508,247 was and still is the lowest total for the franchise since 1921 (strike years included). I lucked out and had a pair of tickets to the Cubs-Phillies game on Monday, Aug. 8, 1988. I was 18. I purchased the tickets early in the season (they still listed a starting time of 1:20 p.m.), long before the night schedule was announced. The thought of scalping the tickets never crossed my mind. I considered taking a friend to the game, but it was only a fleeting thought. My 68-year-old grandfather was the reason I was a Cubs fan and by far was the person who had taken me to the most games. Realizing the significance of the evening, it was a no-brainer. I had to take Pops. Aug. 8 was typical hot and sticky Chicago summer day with the temperature in the 90s and no breeze to speak of. As Pops and I exited the Red Line train at the Addison stop, we noted that the flags atop the center-field were limp. The Cubs announced that they were opening the park that night an hour earlier than usual, at 4:30, and we decided that we wanted to be there when the gates were raised. We wanted to be there for all the pregame festivities and also wanted to take advantage of a rare opportunity to watch the Cubs take batting practice. The Cubs are usually done with BP by the time the Wrigley gates open. I’ve seen visiting teams take their pregame hacks at the Friendly Confines on hundreds of occasions, but that special night 22 years ago is still the only time I have seen the Cubs take BP in their home ballpark. We had long been in our seats in Section 209, Row 15 and the grandstand was about half full when master of ceremonies Jack Brickhouse introduced 91-year-old Harry Grossman at 6 p.m. The crowd was instructed to holler, “Let there be lights!” on the count of three. When we did so, at 6:06 p.m., Grossman hit a switch that ended a 74-year tradition on the North Side. Hell had frozen over. I asked my grandfather if he ever thought he’d live long enough to see what was happening before our eyes. He shook his head and i could see that he was choked up. It was a bittersweet moment for a man who attended his first game at Wrigley Field in the 1930s. The emotions that must have been washing over him were something that, because of my age and relative lack of experience as a fan, I could not totally relate to. As the ballpark continued to fill up, the atmosphere that was developing was anything but typical. It reminded me of a postseason crowd – a lot of big shots and many more who were either casual fans or not Cubs fans at all. The event had taken precedence over the game. Shortly after 7 p.m., in the instant that Rick Sutcliffe delivered the game’s first pitch to Philadelphia’s Phil Bradley, hundreds of flashbulbs lit up Wrigley Field. Three pitches later, Bradley launched a drive onto Waveland Avenue. It was an inauspicious start. But Mitch Webster opened the bottom of the first with a line-drive single off Phillies starter Kevin Gross. Up next was Ryne Sandberg and as the future Hall of Famer strolled to the batter’s box, Morganna “The Kissing Bandit” emerged from a section along the right-field line near the Phillies bullpen and charged toward home plate. The well-endowed trespasser never came close to planting one on Ryno. She was intercepted by several security guards by the time she reached the infield dirt and quickly was led away. The crowd booed. On my tape of that evening’s broadcast, Steve Stone described what a great job the security crew did in apprehending Morganna. “They may have done a great job, but it doesn’t say much for their imaginations,” was Caray’s response. When the game resumed, Sandberg promptly homered into the left-field bleachers, near the well area, to give the Cubs a 2-1 lead. The Cubs handed out white “Opening Night” caps (it remains one of my prized possessions) to fans as they passed through the turnstiles, and as Sandberg trotted around the bases, the fans waved their caps in the air. The Wrigley Field stands were a sea of white. The Cubs added another run in he third inning, but by that time it was obvious that a storm was near. A stiff breeze kicked up and the air became noticeably cooler. Rumbles of thunder could be heard. As the always-deliberate Sutcliffe worked in the top of the fourth, a flash of lightning caused the crowd to shutter and several moments later, at around 8:30, it started to, in the words of my grandfather, “Rain like hell.” The tarp was unrolled and placed over the infield. Fortunately, the upper deck sheltered us from the deluge. As we waited for play to hopefully resume, we drank beer, we talked, we drank some more beer, we talked some more. At about 9:30, a very young Greg Maddux, Jody Davis, Les Lancaster, and Al Nipper emerged from the Cubs dugout and entertained the crowd with several tarp slides. It was funny, but I also remember being concerned about our young 15-game winner’s health. Fortunately, there wasn’t a Cubbie Occurence but the quartet was later fined by a less-than-amused manager Don Zimmer. Predictably, some fans, taking a cue from Maddux and Co., also decided to join in the tarp-sliding fun. Security spent much of the next hour running down those yahoos. It continued to pour and at 10:30, umpire Jim Quick emerged from the third-base dugout and signaled to those who remained that the game was called. All records were scrapped and the game was replayed in its entirety as part of a September doubleheader. The first official game under the lights was played on Aug. 9 as the Cubs topped the New York Mets 6-4. I relaized that my Aug. 8 ticket stubs were possibly of value, but couldn’t pass up a free game. I exchanged them at the Wrigley Field box office and I took Pops to see the Cubs lose to the Cardinals on Sept. 16. It was as unmemorable as the Aug. 8 rainout was memorable. Oh well. A popular theory regarding the Cubs’ failure to win a National League pennant since 1945 was the lack of night baseball at Wrigley Field until 1988. Playing under the sun on a daily basis, wore down the Cubs year after year. This maybe so, but pitcher Bill Hands, who won 20 games for the 1969 Cubs, disagreed. In The Cubs of ’69 (Contemporary Books, 1989), Hands told Rick Talley that exclusive day baseball provided the Cubs with the ultimate homefield advantage. While Cubs players were often at home with their families getting a good night’s sleep, visiting teams were carousing on Division Street late into the night. “If we would have won, everybody would be playing more day games today,” Hands said.